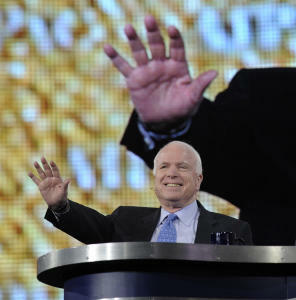 Forty years to the day after an American military plane carried John McCain and his fellow newly released U.S. prisoners of war out of North Vietnam, the Republican senator from Arizona cheered improved relations on Thursday, but urged the former U.S. foe to embrace democratic reforms. The lawmaker, who spent part of his captivity in the notorious "Hanoi Hilton" prison, suffered grievous injuries when his plane was shot down over North Vietnam in October 1967 and endured torture as a POW. He was freed March 14, 1973, and has made return trips to Vietnam as relations with the U.S. have warmed considerably over the ensuing decades. McCain, who sits on the Senate Armed Services Committee and Senate Foreign Relations Committee, is a leading voice in his party on foreign policy.